In order to meet our energy targets as a University, it is important for new staff members to be aware of the University’s commitment to sustainability, and to be motivated to contribute in any way they can. The University has a carbon reduction target of 34% from a 2005 baseline by 2020. 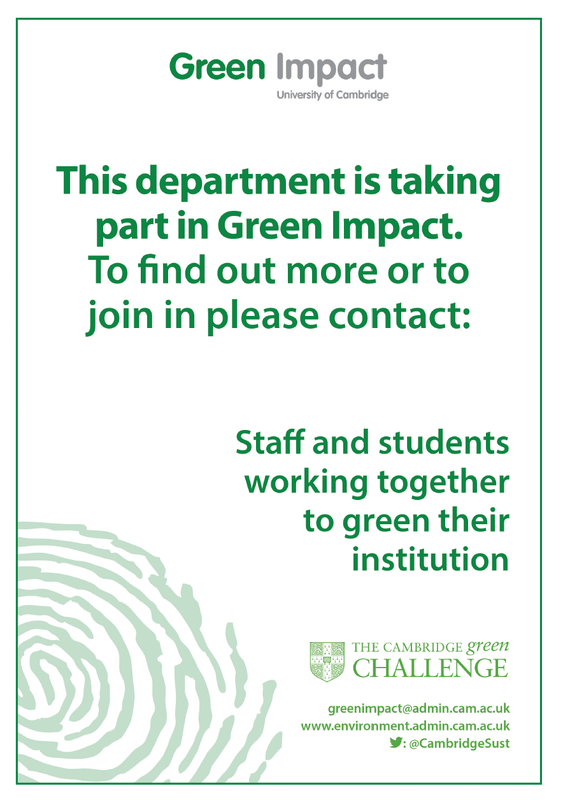 The University emits 77,000 tonnes of carbon per year, equivalent to 10% the domestic use of the City of Cambridge. The University’s energy bill is an astonishing £16 million per year. At one of the ECRP pilot departments, the Gurdon Institute, addressing some of the wasteful behaviours of members of the department led to a 19.5% decrease in electricity usage – the behaviours of members of the department can make a huge difference to the University’s emissions! All departments have a mixed dry recycling scheme. This means recycling does not have to be sorted when disposed of. Nearly everything can be recycled – the rare exceptions are polystyrene, food waste, drinking glasses and wooden stirrers. For full information: environment.admin.cam.ac.uk/what-are-we-doing/recycling-and-waste/z-recycling-and-waste. The University currently recycles around 43% of its total waste. The University has managed to reduce water usage by 63% in the last 20 years, despite a growth of 42% by area. The University’s target is to maintain water consumption per square meter of the estate constant in the face of the estate’s expansion and an increase in academic activity. The University encourages moving away from single-occupancy car use by subsidising train season tickets and the fare for the Uni 4 bus service. Our team is made up of 7 members of the college (fellows, staff & students) who are committed to help promote reducing the college’s environmental impact. All staff have a responsibility to consider the wider environment during their working day, both in the office and on site if your role is operational, project management, or in Maintenance. How can you help to reduce the environmental impact of your job, office, and college as a whole? How can you save money on your commute? If you leave your desk for more than a few minutes, switch off your computer monitor. Turn off your computer fully overnight, or if you’re out of the office for hours at a time. Really off, not onto standby. Dress for the seasons! Don’t expect your office to be a sauna in the winter and an ice box in the summer. If you think the heating/cooling is over the top, look into what you can do yourself with radiators. Do you really need new folders or a brand new stapler, or could you re-use good quality used ones from elsewhere? Could you use staple-less staplers?! Can you consider the following, or do you already: cycle to work; car-share; walk to work; use trains or buses; or use the Park & Ride buses around the City? Could you walk or cycle part way to work? All staff are encouraged to try and save water whenever possible. Wash up by collecting items and washing in a sink or bowl, not under running water. If you see a dripping tap, report it to maintenance.